Spain is set to renounce its hostile Brexit position and threats to derail the UK’s transition deal over Gibraltar after Spanish Foreign Minister Alfonso Dastis said Spain would not turn Brexit into a “hostage-type situation”, it has been reported. Mr Dastis welcomed recent progress in Brexit talks and said Spain would not seek to gain power over Gibraltar during the ongoing negotiations. But the Foreign Minister said Spain would continue to keep an eye on the territory, adding: “We recognise that Gibraltar was ceded to Britain more than 300 years ago but our aim is to recover it. Spanish officials instead aim to sign a pact with the UK to ensure the territory is fully covered when the UK finally leaves the EU. British ministers nevertheless still fear Spain will hold the UK to ransom by threatening to de-rail Brexit negotiations by vetoing the final divorce agreement in a bid to secure concessions on territory and the sovereignty of Gibraltar. The leader of the Conservative delegation in Brussels, Ashley Fox MEP, said Spain’s repeated threats to delay and derail Brexit negotiations have angered other member states. Mr Fox said: ”I don’t think the other Member States would take kindly to Spain bringing forward a new set of demands at the 11th hour and threatening to hold up the transition deal. Other diplomats have also suggested that the issue surrounding Gibraltar is so minor, it would not be allowed to derail wider Brexit negotiations. This comes after Spain nearly stalled the final agreement of the Brexit transition deal last month after it tabled last-minute demands and concessions on Gibraltar. Among these concessions was Spain’s demand for joint access of Gibraltar airport – which has been rejected twice in the past – and improved cooperation on tax avoidance. Spain and the United Kingdom have been engaged in talks since January, with civil servants discussing a bilateral agreement to come into effect at the end of the Brexit transitional period in December 2020. Chief Minister of Gibraltar Fabian Picardo said he would fight to defend British sovereignty of the Rock, adding that talks regarding joint-sovereignty between Spain and the UK should never be allowed to take place. He said: “Rest assured that we are working assiduously to carve out a future for all of us which is grounded in the protection of our exclusively British sovereignty, jurisdiction and control. 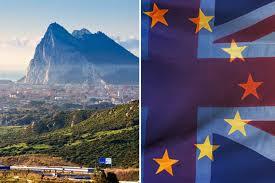 Gibraltar has held two referendums over the years to establish whether its residents would rather remain British, or would prefer to join Spain.